- select all new objects after their are created. Submitted by miauu on Mon, 2019-01-07 12:08. Submitted by obaida on Mon, 2019-01-07 02:52.
one thing i came across when using the script is a button for interactive mode so we can see the changes before closing the window, that gonna be a good thing to add. I attached examble image for that. Submitted by obaida on Sat, 2019-01-05 10:53.
i bought it no problem, thx in advanced. Submitted by miauu on Fri, 2019-01-04 05:56. Press the Donate button, use your card to make a donation and send me an email with the donation details. Submitted by obaida on Fri, 2019-01-04 00:24.
is there any way to buy it without PAYPAL? Submitted by miauu on Mon, 2018-11-26 10:54.
tools. It allows you to place all clones at even intervals in between the original object and the first clone that you create. Submitted by obaida on Sat, 2018-11-10 23:32. 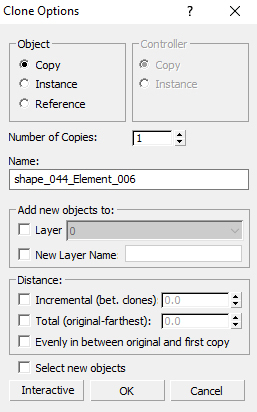 One issue for total and incremental , the distance should be taken automatically (not 0.0) from the distance between the original and the new moved object. Submitted by miauu on Sat, 2018-11-03 09:46. Submitted by Newsbug on Fri, 2018-11-02 21:33. Going to solve my purpose for sure. Hope it working fine without any bugs. Submitted by miauu on Mon, 2018-10-29 09:09. 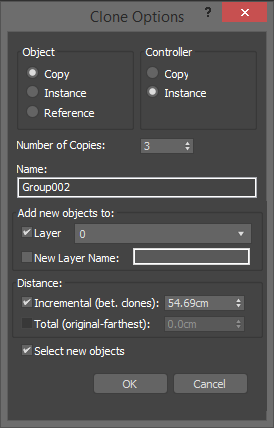 - added "Set incremental or total distance between cloned objects".